The traditions of quality and fine Italian craftsmanship have been maintained by the Montegrappa artisans since 1912. The skills honed to perfection over generations, are used today to realise these beautiful Italian designs. Situated in Bassano del Grappa in the north-east of Italy, the company first started production under the name of ELMO, as a manufacturer of gold nibs and fountain pens. This part of Italy was already a centre for the jewellery trade and so the skills and knowledge required to make fine fountain pens were readily available. Montegrappa pens are still made in the original historic building on the bank of the river Brenta. The use of fine and unusual materials, including gold, silver and celluloid enable Montegrappa to produce fine pieces manufactured using techniques both traditional and high-tech including deep-drawing, piercing, investment casting and CNC machining, as well as etching, engraving and vitreous enamelling for decoration. 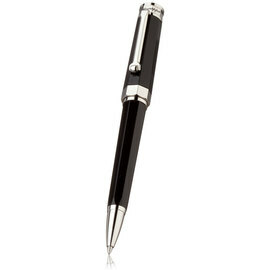 The eight-sided Nero Uno is a classic design from Montegrappa. It's gloss black resin barrel and platinum trim make a bold statement with their simple elegance. Subtle detail and exquisite workmanship set the Nero Uno apart from the crowd. 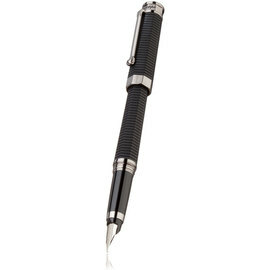 A Nero Uno with a 'sporty' feel, the Montegrappa Nero Uno Linea retains the classic eight-sided barrel and cap of the original, but with a silky matt black finish and linear engraved design, all complemented with smokey-grey colour contrasting polished trim. 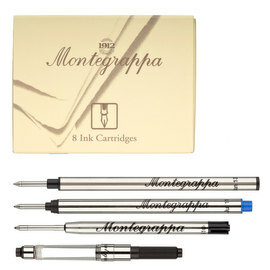 Original Montegrappa refills and inks will ensure that your Montegrappa pen continues to give you writing perfection.